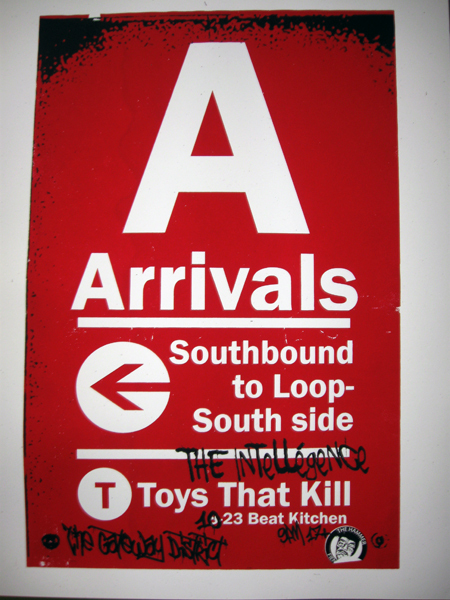 For this poster I felt that The Arrivals needed a definite Chicago feel. 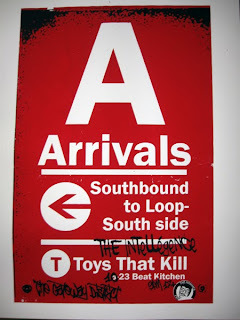 So the first thing that came to my mind was the "L", mass transit rail system that is elevated; hence the "L". So the red line which travels both north and south through the city. On the bottom corner is a Hammer Fiend Club Sticker. Well its actually printed on the poster. The Hammer Fiend Club was started by my friend Patrick. 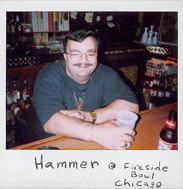 Hammer was and still is a bartender at the Fireside bowl. He hates everyone accept Gerry from MU330. Gerry even took one of the best pics of Hammer. Below. LETS GO TO THE BOATS!